DataMatrix Medical can work within any EHR and customize the way we fit into your workflow. Dictation has long been the industry standard for physician documentation of patient encounters and other charting needs. The use of an EHR software has streamlined documentation for healthcare professionals: charts are available in multiple locations at once, they are easy to share with other providers to better coordinate care, and documentation can occur quickly and accurately. Medical transcription of dictated notes can take this convenience to a new level. With easy integration into your existing EHR software, DataMatrix is able to enter patient data directly into your charts. Dictate your notes as usual. You can use our convenient app, the traditional phone system, or voice recorder. Our medical transcriptionists will complete the medical transcription quickly and accurately. We ensure that the data is correctly entered into the chart based on your preferences. For clients who prefer to use voice recognition software, we offer proofreading services as well. One of our transcriptionists will go into your EHR and review everything you documented to assure the highest level of accuracy. They not only clean up issues with grammar and punctuation, but also ensure that the data was entered into the correct section of the chart. 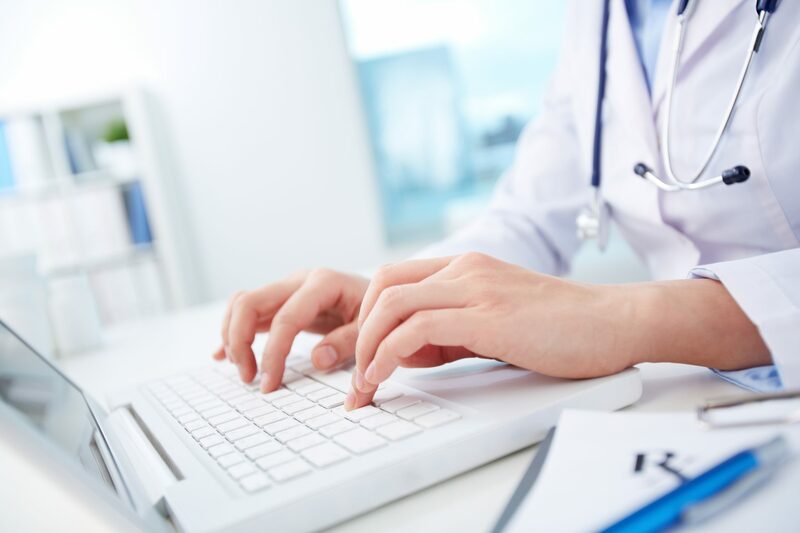 There are many benefits to integrating your EHR with your medical transcription. No matter how quickly you can navigate your EHR software or type, people speak significantly faster than they can manually enter the same information. Dictation saves you the extra time you should be spending with your patients. Integration creates fast and accurate records, which can reduce your risk for errors, claims, and litigation. Increased referrals from and improved communication with referring physicians. Better documentation results in better care, more accurate billing and quicker reimbursement. Our transcriptionists are trained to use the templates that you already use in your EHR. This reduces the amount of dictation and medical transcription costs, and it also reduces point-and-click work for your physicians. Medical transcription with easy integration into your EHR software is extremely affordable! Freeing your physicians from the burdens of documentation gives them more time to see patients during the day. We take the safety and security of your data very seriously and have several measures in place to protect it. However, it is not enough to only have technological security measures in place. The people who are directly working with your data must also be well-versed in HIPAA requirements and compliance. DataMatrix signs and abides by the Business Associate Agreement for all clients in addition to the physical and technological securities we have in place, our medical transcriptionists are highly trained in HIPAA compliance and will protect your patient’s confidential health information. Get in touch with DataMatrix Medical to learn more about how we can easily and seamlessly integrate our medical transcriptionist services with your EHR and existing workflow.